Prepaid UPS fuser core return label (for use in the continental US only). This label is good for the return of one fuser core. Place the core in the original box, apply the UPS label, and give the box to to your UPS driver, or drop off at UPS. This label is optional - you may return fuser cores via the carrier of your choice. Shipping charges for core returns are your responsibility. 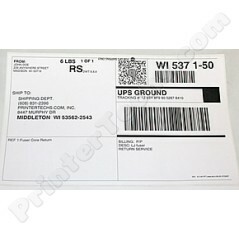 Optional prepaid UPS fuser core return label for use in the continental US states. Fusers and maintenance kits sold on exchange are discounted because you are agreeing to return your used fuser (core). This label is good for the return of one fuser core. Place the core in the original box, apply the UPS label, and give the box to to your UPS driver, or drop off at UPS. This label is optional - you may return fuser cores via the carrier of your choice. Shipping charges are your responsibility. Cores must be returned within 30 days of the invoice date-- a core charge will be assessed after 45 days.